Each week several newsletters, magazines, and letters from various missionary groups arrive in our offices at the Pastoral Center. This week I received the most recent newsletter from the Missionary Society of Saint James the Apostle, founded by our own beloved Cardinal Cushing over fifty years ago. 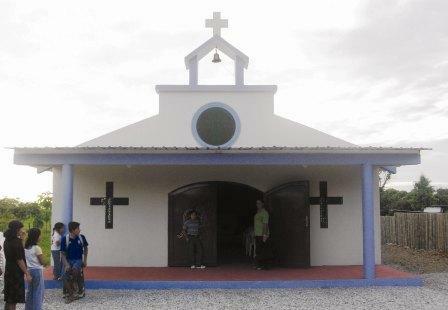 The focus of this newsletter was the Parish of Jesucristo, Pan de Vida (Jesus Christ, Bread of Life) located in the town of San Francisco outside Guayaquil, Ecuador. The present pastor of the parish is Father Patrick “PJ” Hughes, a priest of the Society of Saint James who hails from the Diocese of Ardagh and Clonmacnois in Ireland. Because of the leadership and dedication of Father PJ and his predecessor, Father Frank Jones, the parish now boasts a four room schoolhouse, a beautiful parish church and rectory. Some of you may remember Father “PJ” as the priest who preached a Mission Appeal for the Society in Saint Clement Parish, Somerville and Saint Mary Parish in Brookline. They prepared for First Holy Communion over the period of a year by attending a class each Saturday morning which lasted for two hours. They were supported by their parents and were also expected to attend Mass each weekend where they would learn more about their faith and the mystery of what they were preparing to receive. Their Confirmation program is similarly impressive. When I saw the pictures in the newsletter, and those on Father’s blog, I e-mailed him and asked his permission to share a couple of them in my column this week. He sent back an enthusiastic “yes” and so I am happy to share photos of both celebrations with you. Every year, the St. James Society depends upon the generosity of our donors through our parish Missionary Cooperative program. We are proud to support this great Boston-based missionary effort. To learn more about the Missionary Society of Saint James the Apostle, please visit our website's Propagation of the Faith page.